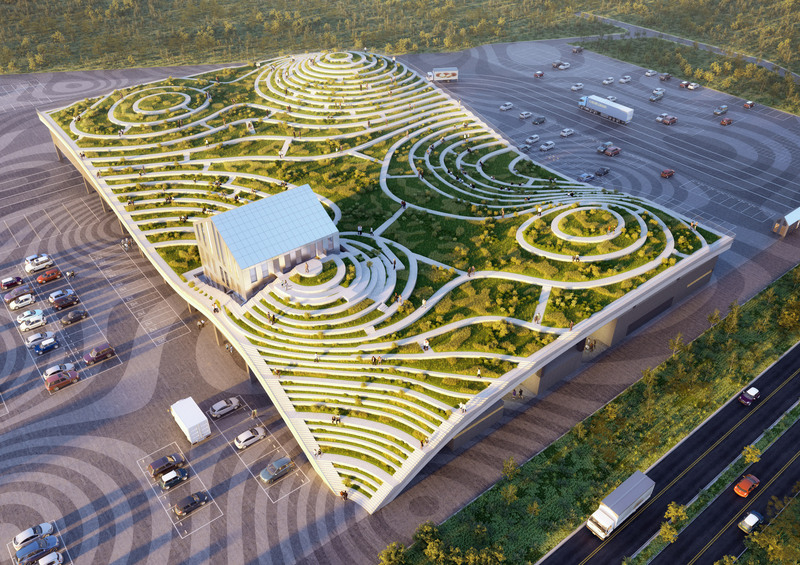 MVRDV has broken ground on the Tainan Xinhua Fruit and Vegetable Market in Taiwan, which will be topped by a terraced green roof for farming. The giant wholesale and auction market, under construction in the foothills of east Tainan, was commissioned by Tainan City Government Agriculture Bureau to create a food supply hub for the district. MVRDV worked with local studio LLJ Architects to design the structure, which will be topped by an undulating green roof intended to echo the surrounding landscape. This will serve as a viewing deck, but will also be used for growing crops. MVRDV plans to elevate the rooftop farm high above the market to allow sufficient natural ventilation, but it will extend down at the east corner to provide a ground-level access point. The rooftop will be divided into a series of stepped terraces, each tailored to grow a different crop. Seating areas will also be incorporated for visitors to relax and enjoy the view. “Tainan, in my opinion, is one of those towns which is so beautiful to me because of its nature, agriculture fields, farms, sea, and mountains. 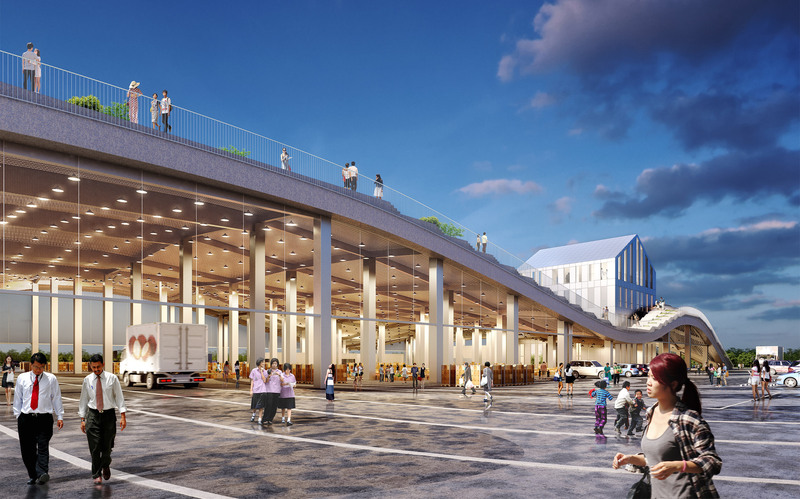 Tainan Market can become a building that symbolises this beauty,” said Winy Maas, co-founder of MVRDV. When complete, Tainan Xinhua Fruit and Vegetable Market will sit close to a number of public transport links, ensuring it is accessible for traders, buyers and visitors from both the city and the surrounding farmland. It will measure 80,000 square metres and house 180 market and auction plots, all sheltered by the farmable green roof. MVRDV’s visuals also show a four-storey structure projecting up through the structure, providing a second access point to the rooftop. 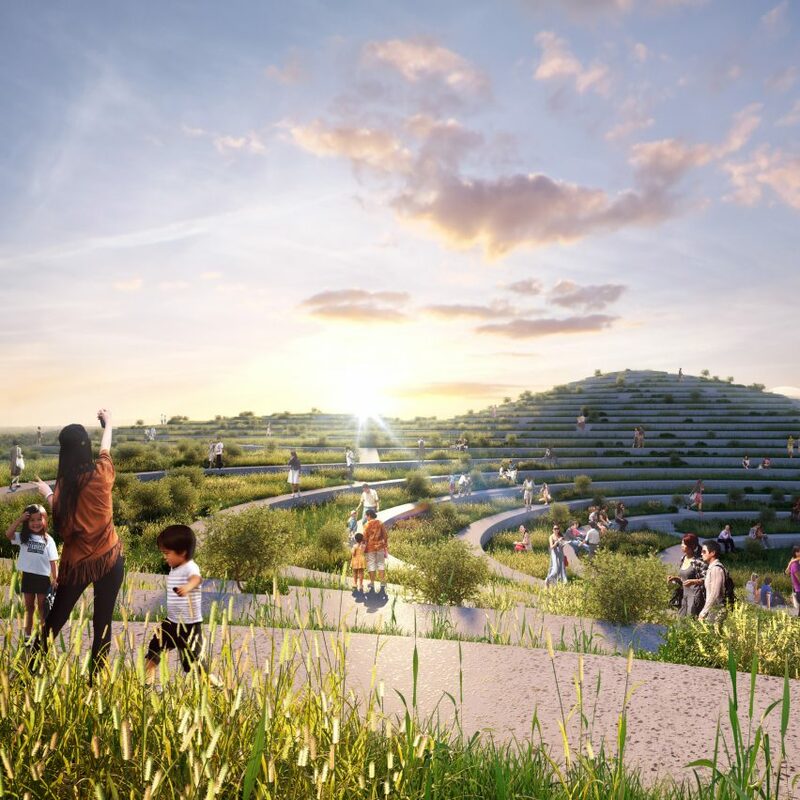 The structure will comprise offices and a restaurant, alongside an exhibition centre that MVRDV hopes will be used to display agricultural products from across the region for educational purposes. 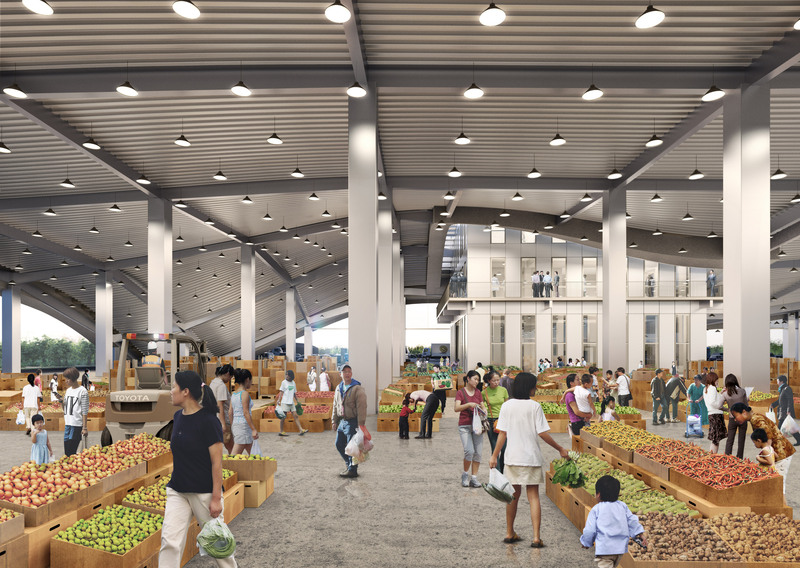 Expected to complete in late 2020, Tainan Xinhua Fruit and Vegetable Market taps into the growing trend for architecture that incorporates farming. Architect Chris Precht is among those championing the idea and recently unveiled his own concept for towers that incorporate vertical gardens. MVRDV is also working on another project in Taiwan. The Tainan Axis is an artificial beach and lagoon set to replace a flooded shopping centre. Visualisations are by Antonio Coco and Pavlos Ventouris. Design team: Hui-Hsin Liao, Xiaoting Chen, Chi Yi Liao, Chiara Girolami, Enrico Pintabona, Maria Lopez, Gustavo van Staveren, Emma Rubeillon, Dong Min Lee, Jose Sanmartin, Cheng Cai and Nienhsun Huang. The post Undulating rooftop farm terraces will top food market designed by MVRDV for Taiwan appeared first on Dezeen.